Funding for all Capital Arts activities, except the Opera Minor Education Outreach Scheme, comes from tuition fees, professional engagements, CD sales and corporate sponsorship. Corporate sponsorship with our partners has seen such amazing benefits for the Capital Arts children and for the businesses involved. 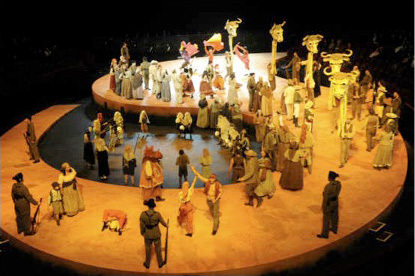 Firms have a high profile performing arts group available for their functions and, through Capital Arts, businesses and clients have an involvement with various prestigious performing arts events in London. A tax receipt for the entire donation is issued in March for the prior year's contributions. Align your firm to one of the most successful children's performing arts groups in the country. Join the Capital Arts Children's Choir at its many professional engagements. Take advantage of corporate entertainment at major concert halls and theatres to entertain your clients. The children's choir has recently been sponsored by British American Business and the choir gave a recital at the BAB Christmas ball at the Dorchester Hotel last Christmas. The choir has also received international sponsorship from Qantas, Chanel, Bond no9 and the Manhattan Chamber of Commerce. Funding for the Education Outreach Scheme is project led and independently audited. Each project is costed and funds are raised from council grants, government grants and sponsorship. A grant from Welwyn Hatfield Council gave an opportunity for nearly 300 children from Welwyn and Hatfield primary schools to record 'Gloria In Londinium' for the Olympics Arts project at the Abbey Road Studios, and recently a grant from Hertsmere Borough Council gave children from Hertsmere a chance to take part in a production of 'Doomwatch Castle' at the Wyllyotts Theatre.